Andrew P. Scott's practice concentrates on zoning, land use, governmental entitlements and various forms of economic development incentives, including tax increment financing, tax sharing and corporate tax credits. He also counsels clients in state and local ethics matters, including lobbyist registration and campaign finance. 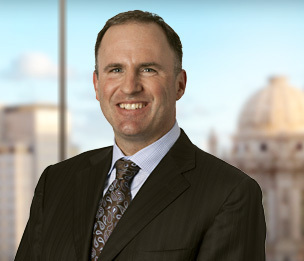 Prior to joining Dykema, he was a partner at DLA Piper, where he represented Fortune 500 companies in negotiating incentive agreements in connection with their siting of their new corporate headquarters and manufacturing facilities. He also represented developers and businesses on land use and zoning matters around Illinois and the region. Before going into private practice, Mr. Scott was assistant counsel to the Honorable Michael J. Madigan, Speaker of the House, Illinois House of Representatives. As assistant counsel to Speaker Madigan, Mr. Scott acted as staff attorney for three committees in the Illinois House: Environment and Energy, Electric Utility Deregulation and Public Utilities. In that role, he reviewed and drafted legislation, analyzed bills and provided detailed memoranda on legislative matters of special interest to House leadership. Mr. Scott's legal experience also includes work with the Capital Litigation Division of the Illinois Appellate Defender's Office and the Illinois Commerce Commission and a clerkship with the Honorable W. Thomas Rosemond, Jr.
Before attending law school, Mr. Scott was a lobbyist for a public policy consulting firm in Washington, D.C. Represented Lucas Museum of Narrative Art in connection with land use and zoning approvals for a new museum and public open space. Represented international airline on tax increment financing matters in connection with its siting of its corporate and operational headquarters. Represented national developer in connection with a 110-acre mixed-use development on a former Air Force base in South Carolina. Represented London-based lender on land use and zoning due diligence matters in connection with a $250 million loan to acquire and develop 54,000 acres in New Mexico. Represented a joint venture between an industrial developer and a U.S. automobile manufacturer on land use and incentive matters in connection with the development of a 180-acre auto parts supplier park. Represented an international airline manufacturer on land use and incentive matters in siting of an airplane assembly facility. "Real Estate Deals Demand a Delicate Balance"